In addition, you'll read stories from real mentors and mentees that reveal the life-change and lasting effects that come from vibrant mentoring relationships. 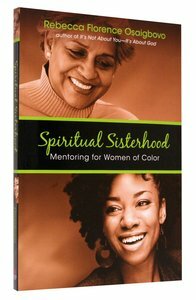 Older, spiritually mature African American women also offer their wise words of advice, gleaned from years of serving as spiritual mothers to others. Whether you're in a family, workplace, school or ministry context, whether you're young or old, you can begin a mentoring relationship. Let Rebecca Florence Osaigbovo and her spiritual sisters and mothers show you how. Osaigbovo is an author and speaker with Chosen Vessels Ministries, focusing on challenging and inspiring women to be agents of change in their families, workplace and communities. She also speaks at churches and conferences on emotional healing, spiritual growth, prayer and intercession. She is based in Detroit, Michigan. She was trained as a registered nurse. 3 Who Is Qualified To Be A Mentor? Unavailable. Out of Print. Only available while stock lasts. eBook is Available.